As we have been looking around costume stores this October for Witch brooms. After searching just about every costume shop in the area, it seemed like the stores didn’t have what we were looking for or they were ridiculous expensive for cheap plastic. Since we needed a larger number of brooms, we decided to go ahead and make them ourselves. 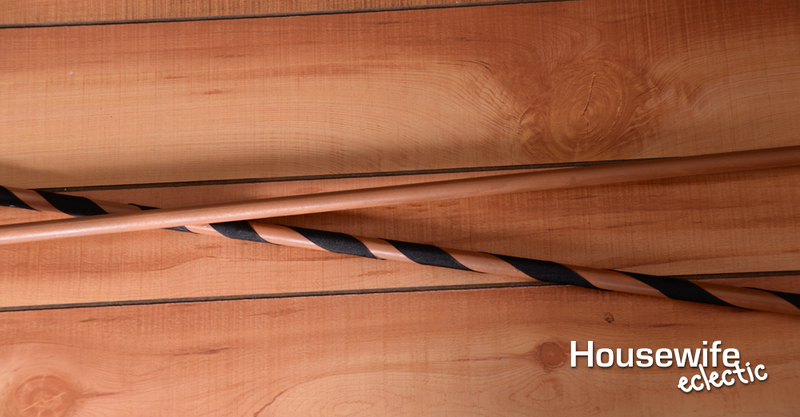 These diy witch brooms turned out darling and they were incredibly easy to make. The best part? They cost a fraction of other brooms we saw while we were searching and they were way cuter! Perfect for a little witch costume, Halloween decoration or maybe a game of Quidditch? Spray paint the dowel brown. Make sure to spray paint one of the ends as well. 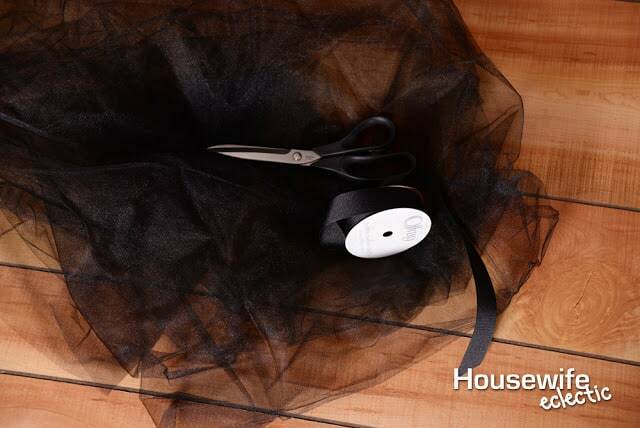 Fold your tulle in half long ways and then in half again, so you have one half yard length that is four layers thick. Hot glue the end of the ribbon to one end of the dowel. Wrap the ribbon around the dowel, adding a dab of hot glue to make it secure every few wraps of the ribbon. Glue one end of the tulle to the dowel, about 1 inch from the bottom. Wrap the tulle around itself, adding a dab of glue with every full wrap of the tulle to secure it. Once the tulle is wrapped all the way around the broomstick. Take a piece of ribbon and wrap it wound the top of the tulle, covering up any mess that may have been made when hot gluing the tulle. Use scissors to make cuts every couple inches around the bottom of the broom and then fluff the tulle until the diy witch brooms looks the way you want it to. What would your use your Witch Broom for? This looks like the perfect broomstick for any budding witch on Halloween! I know some young boys and girls who would love this! LOVE these (easy to make) broom sticks! They are pretty chic and also in the fall theme! I would totally put these out for decoration! You are so creative! I wish I had the patience to make things like this–they are adorable! I can totally see little witches running around with these. They are a cute idea to complete the whole look on Halloween. For us non-crafty Moms, it seems easy too. What a fun idea! My friend has a Witches's Brew party every year. I will have to show her these as they would go perfect with her decor! This is like a glamour witch broom! I have a cute sign on my front porch that says, "park your brooms here" I need to make a few of yours to put out there with the sign! 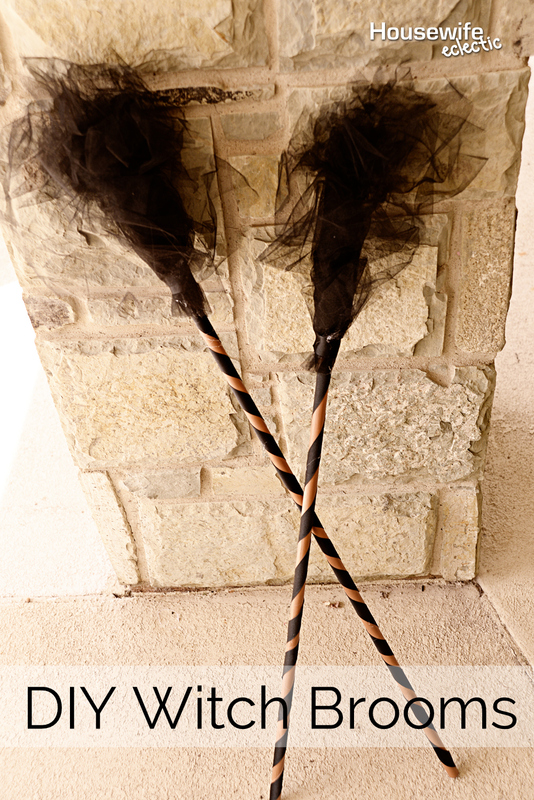 Both my girls are being witches this year, I will have to make them these adorable brooms! Thanks for sharing! I love DIY projects. I hate buying things that are overpriced when I can just make it myself. Great post! My twin granddaughters would love this. They both have witch costumes, but no brooms. Thanks for sharing this. Those are adorable! I think that my kids would definitely love to add them to their regular costume routine – regardless of Halloween! I never would have thought of using tulle for a broom! That's really nice because it gives off an even creepier effect. I love how everything turned out, perfect for your little witch or warlock! I will be a witch this year for Halloween! I have my outfit but I was actually missing a broom. Thanks for the inspiration! So creative! These are SO cute!!!!! My daughter keeps asking me to be a witch for halloween, so this will be perfect! These are perfect! We're having a family Halloween party soon and these would be the perfect addition! I love how easy they are to make! My kids could probably help me do them! 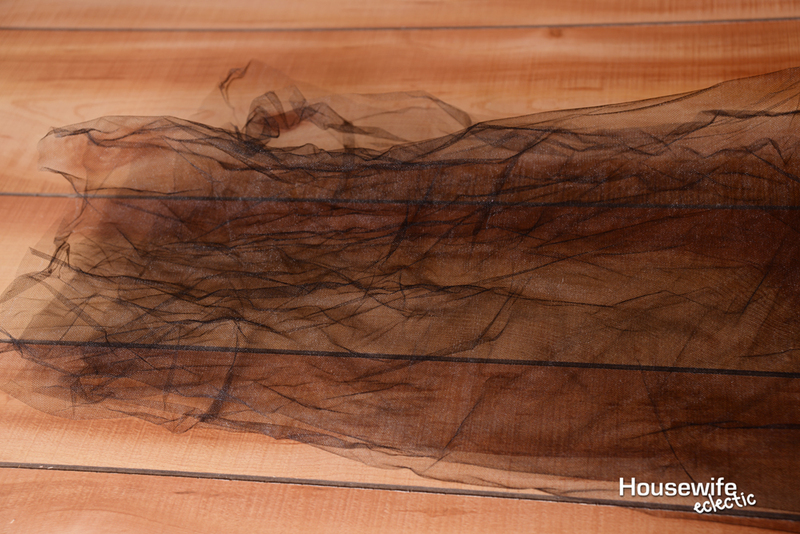 Using tulle is genius! I'm convinced. 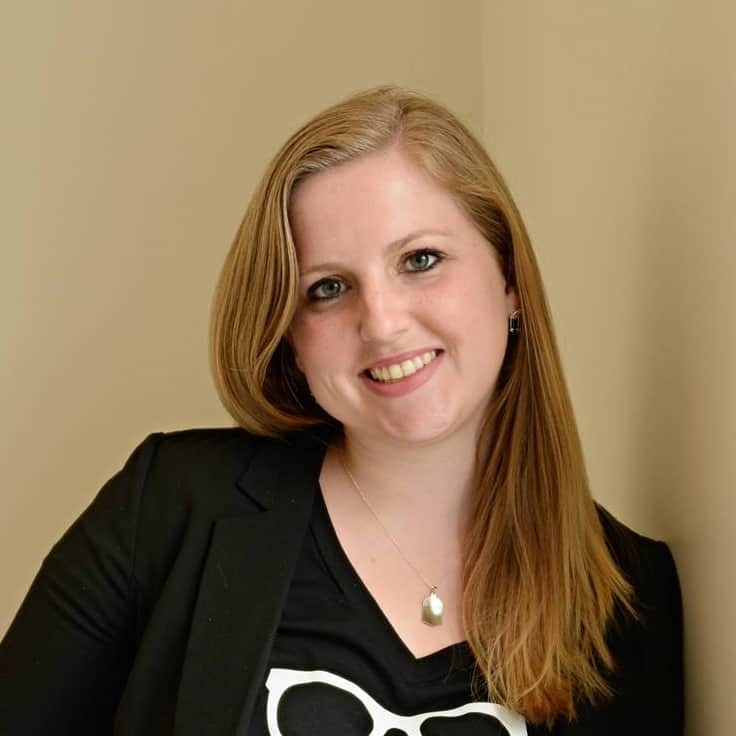 You're the queen of fun and creative DIY! How cute are these?!? Love the twist with the tulle. Wish I were as creative as you! These are such a cute Halloween craft. I am going to need to make these with my kids. These would make such a great addition to the decorations that I have around the house. So cute! You're right, they turned out much cuter than the brooms sale in the shops. The fact that the cost is much lesser than buying at shops is also the winner. I'm not sure where I would place these brooms since I really don't do much decorating for Halloween, but I adore these brooms, nonetheless. They're so cute! This is such a cute idea! I just love decorating for Halloween, I pinned this!! THis is such a fun DIY project for Halloween. My son would love to have these as part of our decor. 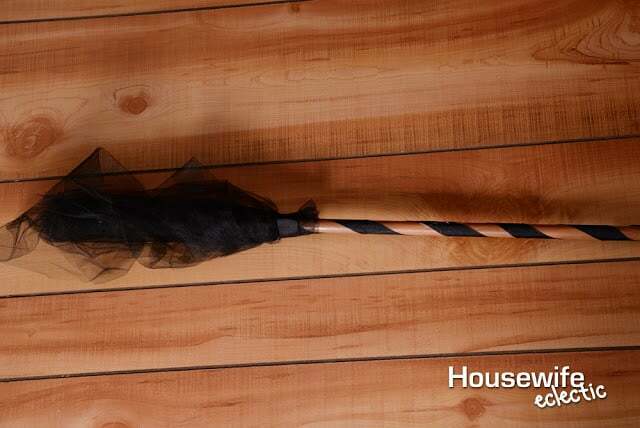 This looks like the perfect broomstick for any budding witch on Halloween! I know some young kids who would love this! What a great idea! And easy to do, too. I'm actually pretty sure I have all the supplies on hand… lol. Thanks for sharing this! What a great idea, and so simple too! I would have never thought of using tulle, but it's perfect for this! What an adorable halloween DIY! You're so creative! I can't get enough of seasonal decor — will have to recreate this now that i'm in my new house!